An igloo-looking habitat sits on a volcano’s rocky soil. Six astronauts have been living there isolated for months, doing geologic field work. It takes around twenty minutes for any message to travel between the habitat and Earth. Except the habitat is on Earth—it’s the Hawai’i Space Exploration Analog and Simulation (HI-SEAS), sitting 8,200 feet above the sea on Hawaii’s Mauna Loa volcano. 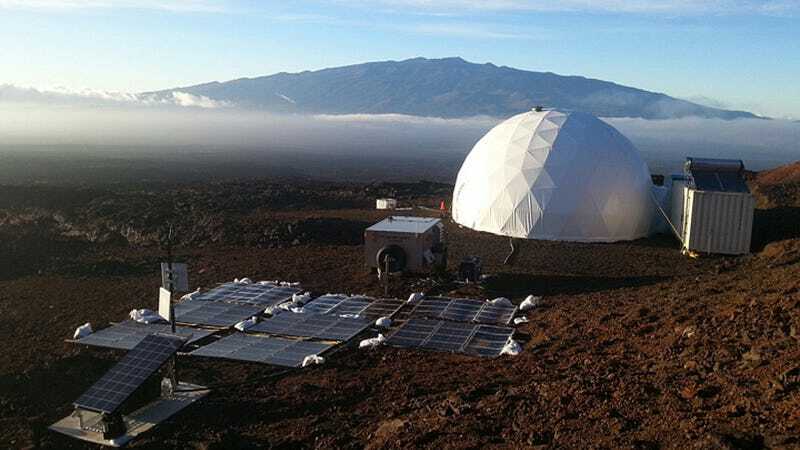 NASA and the University of Hawai’i built the habitat in order to simulate what a long-term mission to Mars might be like. A new podcast from Gimlet called The Habitat will cover one team’s year-long journey into HI-SEAS as they work together and get to know one another. While the scientists have goals and perform experiments on Hawai’i’s faux Mars, they themselves are the experimental subjects. The project’s scientists hope to understand how people cope with a long isolated period, how they complete tasks as a team, and what kind of crew composition will work best together, according to a NASA release. After all, if you’re stuck on Mars for several years with only a few other people, it won’t help if you hate them. HI-SEAS’ first mission began in April 2013, and its sixth began this past February. This most recent mission was halted after a crew member went to a hospital. The Habitat covers the year-long HI-SEAS IV mission. Levy gave each crewmember an audio recorder and would offer prompts via email for them to answer in an audio diary. There are all sorts of surprises, both funny and tragic. For example, French crew member Cyprien Verseux learned of the 2015 Paris Terror attacks while living at HI-SEAS. You can listen to a preview here. The podcast debuts tomorrow, April 18th.